As many of you already know Saturday night is my Pizza Night. Always pepperoni. For years I’ve followed a Jamie Oliver recipe for a basic bread dough which to be honest has served me very well. I’ve made this dough so many times that I no longer weigh the ingredients and I can gauge how much flour I’m using depending on the size of the mound on my worktop. I make a decent sized well in the flour and add a good glug of olive oil before adding the yeast/water/honey mixture and stir with my claw-crane hand. Once a ball of dough has formed I’d then flour the surface and knead for several minutes before letting it prove under a tea towel for up to an hour in a warm place. In the past I’ve even made a small loaf of bread if I’ve felt there was excess bread dough. I would normally cook my pizza dough directly onto the oven rack and bring it out once I felt that the dough was cooked (frequently mis-timing this!) often having to settle for a dense, undercooked doughy pizza. Flavour-wise, the Jamie Oliver recipe with honey was tastier; whilst the Paul Hollywood recipe would cook retaining shape and forming a crispier crust. Recently, however, a friend and fellow foodie introduced me to the joys of cold proving also know as cold fermentation. And like me, you’re probably thinking back to your school science classes where you were told, “Yeast is a living thing and needs food and warmth to function properly.” But this is the crux of the matter; the lukewarm water activates the yeast and it starts to produce carbon dioxide. By slowing down the activity of the yeast; at cool fridge temperatures, yeast behave differently producing more desirable flavour compounds. It also produces carbon dioxide (the air bubbles present in bread) more slowly. Long fermentation gives the enzymes present in flour more opportunities to link up into gluten, subsequently gluten structure is improved. Finally, the colder the dough when you shape it before the final proof, the fewer bubbles are forced out of it. So what’s the ideal time-frame for a cold fermentation? J Kenji Lopez-Alt, Managing Culinary Director of Serious Eats’ Food Lab made a large batch of dough and allowed it to cold-ferment over 10 days. His research suggested that 3-5 days cold proving produced the best results; dramatically improved flavour, texture and workability. 1st: In a large bowl mix the flours and salt. 2nd: In a measuring jug, mix 200g of lukewarm tap water with the yeast and olive oil. 3rd: Pour this into the flour mixture and using your hand like a claw-crane mix until well combined and then knead for 3 minutes. Allow to rest for 15minutes. 4th: Knead the rested dough for a further 3 minutes. Cut into 2 equal pieces and shape into a ball. Place on an oiled tray and cover in cling. Place into the fridge for anything from overnight to 5 days later. 5th: Remove from the fridge 45mins before you begin to shape it for pizza. Wetter is better. The dough should be super sticky and almost flow out of the tray rather than fall. Use coarse semolina rather than flour to help the base slide easily on and off the paddle and stone. Wetter is better. 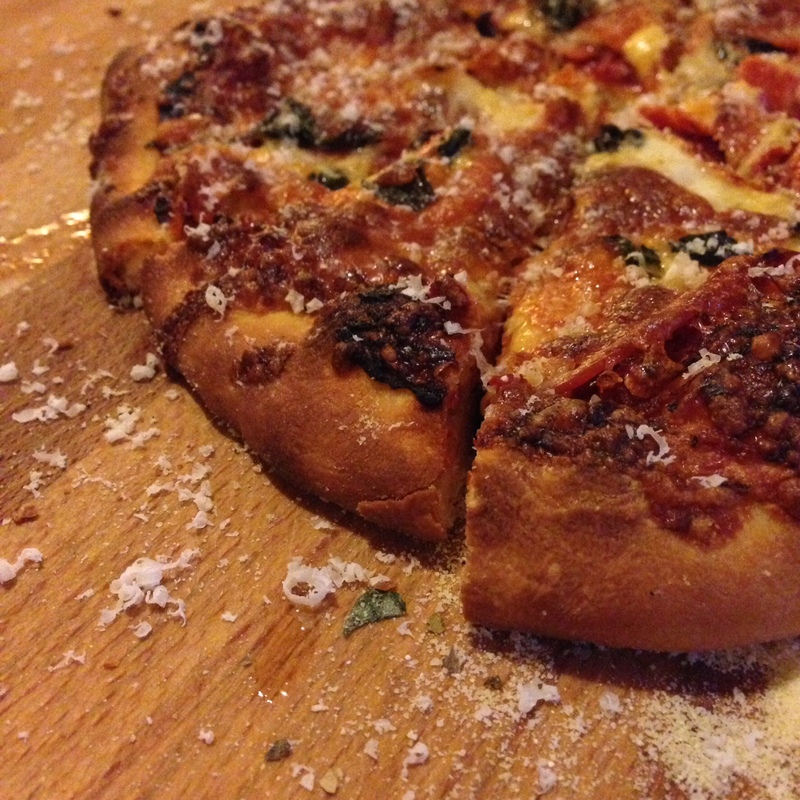 Shape your pizza dough by hand – don’t use a rolling pin. Set your oven to its highest setting and heat your pizza stone for at least an hour. And just in case you’re still not sure – Wetter is better! When you make Roberta’s recipe, the first thing that you will notice is the tiny amount of yeast that you need to use (not even half a 7g sachet) but trust me that it is enough to produce the desired amount of fermentation. My only reservation with the cold prove method is that you need to be quite organised if you chose to have a cold-fermented pizza. I made my batch of dough on Thursday night and reaped the rewards on Saturday. If, however, I just did not have the time during the week to create the dough far enough in advance, I would have to rely on the warm prove method – accepting that the dough would not be as established in flavour or texture as its cold fermented counterpart. Either way – nothing beats a pepperoni pizza and Saturday will always be my pizza night. Good read and great info! Thanks for sharing Crak!! I use some sugar in stead of honey…id like to try the honey version though..how much honey do you normally use Rob?